This month, The Weekend Gourmet Dines Out is featuring Dough Pizzeria Napoletana. This popular San Antonio pizzeria serves some of the best Neapolitan-style pizza that you'll find this side of Naples, Italy. Their pizza is the real deal, folks! Owners Doug and Lori Horn even brought their wood fired brick oven from Italy to ensure the authenticity of their pizza. This insistence on authenticity paid off. Last July, Chef/Owner Doug Horn received Associazione Pizzaiuoli Napoletani (APN) certification from Roberto Caporuscio, Delegato APN-USA. APN is the Italian governing body that teaches the art of Neapolitan pizza making and certifies adherence to authentic procedures. With recognition far and wide, Dough is regarded as some of the best pizza in the United States. All I know is that their pizza is some of the best I've eaten anywhere...and I'm lucky that Dough is located right in my backyard! We were recently invited to dinner to try some of their signature dishes, and it was a delicious experience from start to finish! 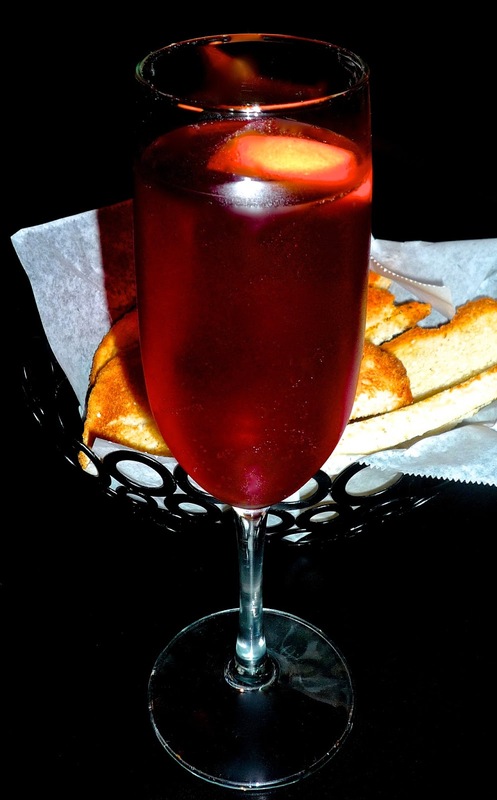 I started with a sweet and fruity champagne-based cocktail from the cocktail menu. It was light and refreshing, and it paired perfectly with our selection from Dough's extensive fresh Mozzarella & Burrata Bar. Lori recommended that we try the Fior de Latte house-pulled burrata, served with roasted Colorburst Farms tomatoes, basil pesto, roasted garlic, balsamic reduction, and flatbread. What a fabulous start to our meal! The plate was stunningly gorgeous...and incredibly delicious! If you've never tried burrata, it's a cheese lover's dream come true: the outside is fresh mozzarella, and the inside is a creamy filling. This burrata was creamy and mild -- and it paired perfectly with the robust flavors of the pesto, balsamic, and garlic. We spread a bit of each on a piece of warm-from-the-oven flatbread and smiled happy smiles! This substantial appetizer is perfect for 2-3 people to share. However, it would also work for a lunch or light dinner if dining solo. I could've happily eaten this burrata plate all evening...but then our pizza duo arrived. We opted to share two pizzas, one veg-friendly...and one that's a carnivore's delight! The Fontina features nutty Italian fontina cheese, oak-roasted mushrooms, caramelized onions, and Parmigiano Reggiano. The meaty Pork Love pizza features a bevy of flavorful pork products: sopressata salami, sausage, pancetta, and speck...along with house-pulled mozzarella and tomato sauce. Both pizzas cooked in minutes in Dough's brick oven, which reaches temperates near 900 degrees. The resulting pizza comes to the table with a nice crust, chewy and a bit crusty...including strategic charring, which gives the pizza a slightly smoky flavor. Both pizzas were absolutely heavenly! The Fontina is so flavorful that even the most devout meat lovers will never miss the meat. The sweet-savory caramelized onions, earthy roasted mushrooms, and nutty fontina work perfectly together. This combination of flavors is positively addictive...I loved it! The Pork Love is a meat lover's dream come true -- smoky, meaty, and cheesy. If you've never tasted speck (a ham product) or sopressata before, you're in for a real treat. These pizzas are fabulous...definitely NOT the pizza you grew up eating as a kid. Unless you grew up in Naples. We were starting to get a bit full by then...but then Lori came out from the kitchen with a trio of desserts for us to try. We grabbed our spoons and dug in! 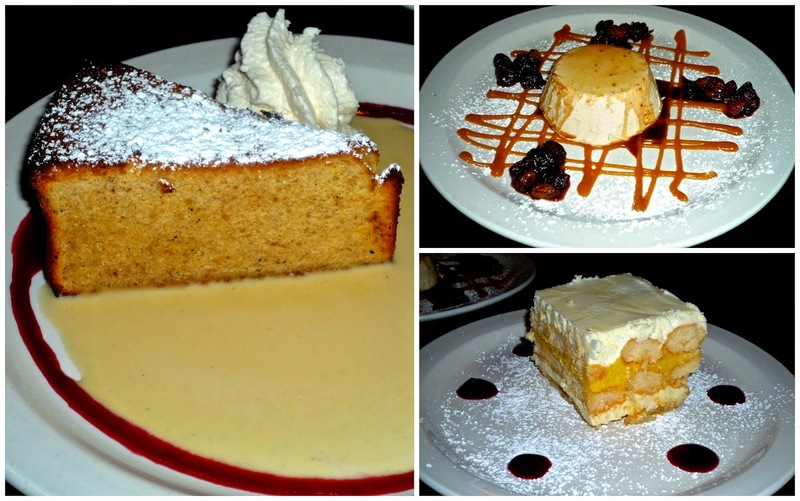 We sampled the house-made Limoncello Ricotta Torta, Carla's Panna Cotta, and the unique Polenta Cake. All three desserts were delicious...and not overly sweet. The limoncello torta is perfect for a citrus lover like me...tart, with just enough sweetness to take the edge off the lemon. It was reminiscent of a citrus tiramisu. This dessert was very refreshing on a Summer evening.The panna cotta was creamy...almost velvety...topped with caramel sauce and dried fruit. Somehow, it was both rich and light. The most surprising dessert of the trio was the Polenta Cake. It was served on a pool of creme Anglaise and berry coulis. The cake was moist and substantial, with an earthy cornmeal flavor and a subtle hint of citrus. We decided that this was our favorite dessert of the trio...not overly sweet or too filling. It was unique and flavorful...we'd definitely order it again. If you find yourself in San Antonio and craving some amazing pizza, Dough is located near North Star Mall...inside a shopping center at Loop 410 and Blanco Road. Thanks to a recent expansion, waits for a table at Dough are a lot shorter now. There's also lots of outdoor dining space for al fresco dinners when the weather cooperates. Dough also has a second location in Dallas for Texans who live near the Metroplex. For authentic Neapolitan pizza, there's no need to hop on a plane for Naples...Dough has just what you need right here in Texas! Disclosure: Dough provided us with a complimentary dinner to facilitate this feature. All opinions expressed are my own.